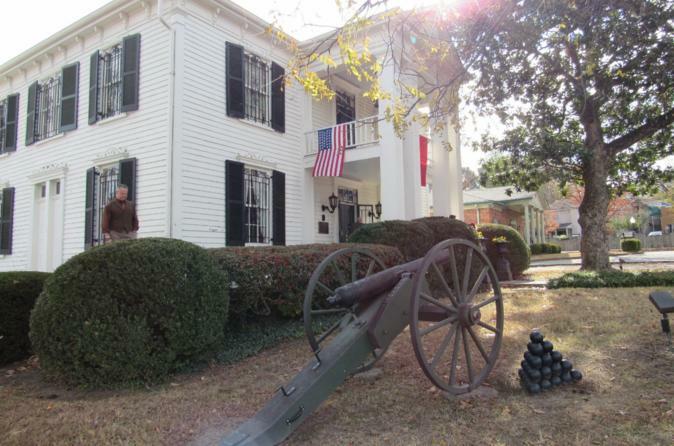 Travel about 30 minutes from Nashville to Franklin, where your admission to the Lotz House Civil War Museum includes a 30–60 minute walking tour that takes you through the historic house. Built in 1858 by a German immigrant named Johann Albert Lotz, the house showcases the master carpenter's craftsmanship and eye for design. Your expert guide points out Mr Lotz’s fine wood carving on three fireplace mantles, among other examples. Note the scars from a fierce Civil War battle that took place just outside the Lotz House in 1864. During the fighting, the Lotz family took refuge in the basement of the Carter House, located across the street. When they emerged, thousands of soldiers lay dead outside. The family decided to turn their home into a hospital for the wounded. Fortunately, the Lotz House features happier tales too. Along with Mr Lotz’s work, you can admire collections of fine arts and antiques throughout the house, including furniture crafted in the 1800s by artisans John Henry Belter and Prudent Mallard. Antique porcelain dishes from Paris are on display, as well as a rare collection of taxidermy birds, captured and mounted by the famed ornithologist John James Audubon. Learn about the remarkable career of the Lotz’s daughter Matilda. After financial setbacks post war, the family moved to California where Matilda studied design and won top honors. She continued to work in Paris, eventually becoming a painter with commissions from royal families throughout Europe — a rare opportunity for a woman of her time. Today, she is celebrated as one of California’s leading early female artists. Your guide shares her story and a painting of hers that hangs in the Lotz House. With beautiful antiques, civil war history and a fascinating family story, the Lotz House offers a great opportunity to step back in time.